At one point or another, a company will send its employee on a business trip. 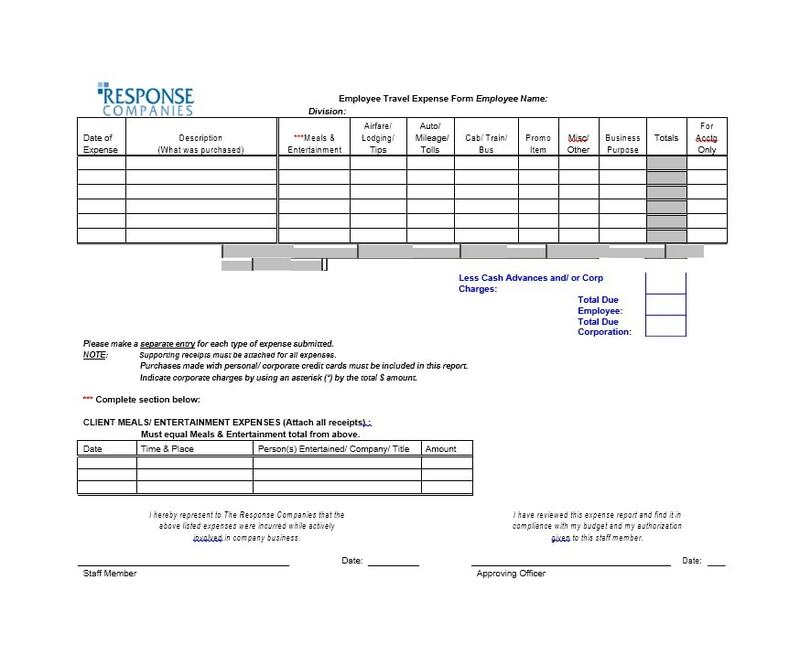 In these cases, the employees would need to submit a travel expense report when they return. 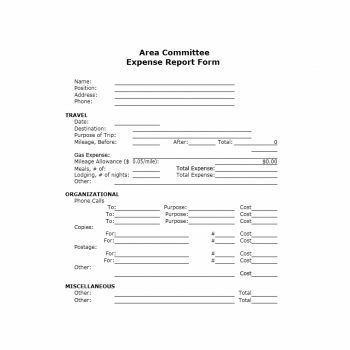 The report contains all the information about what the employee spent while on the trip. It serves a very important purpose. 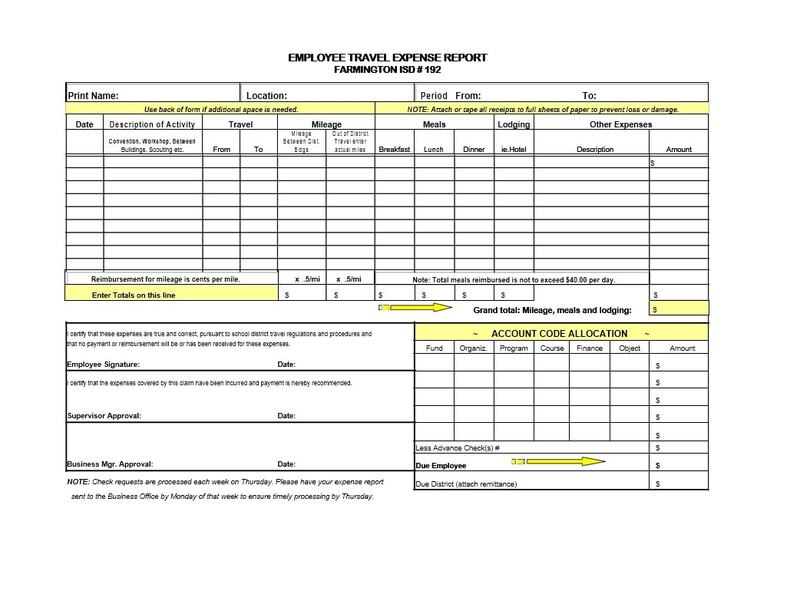 It helps determine whether the employee’s expenses on the business trip were valid or not. 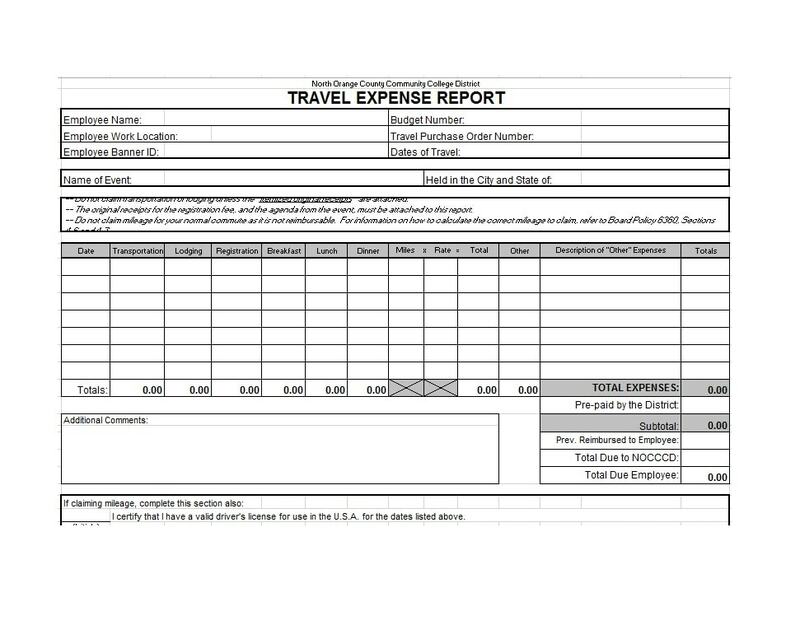 A traveler uses a travel expense report form to report all his expenses. 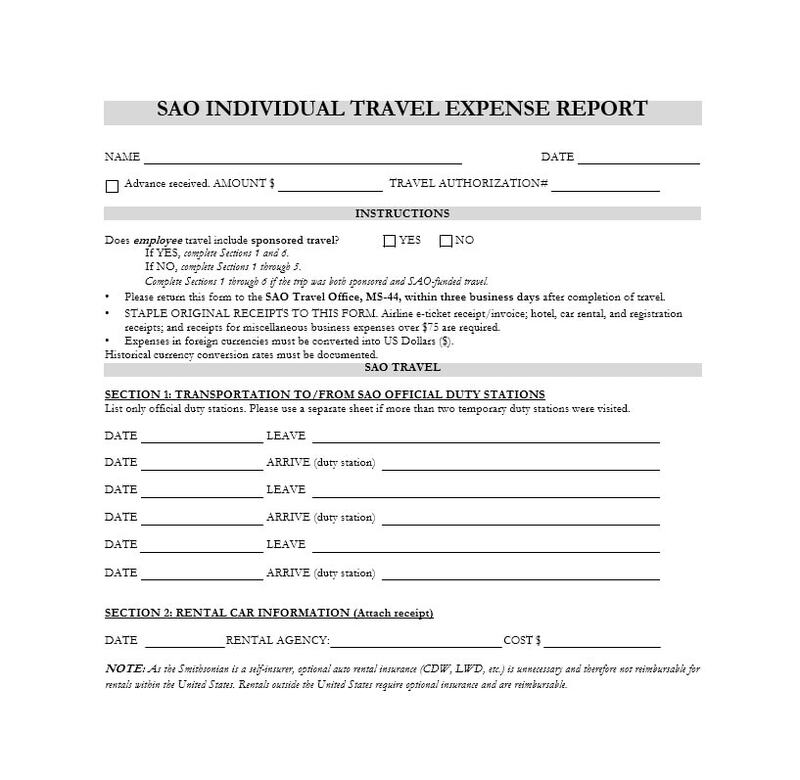 This is a necessary document especially if the traveler wants to receive reimbursement. 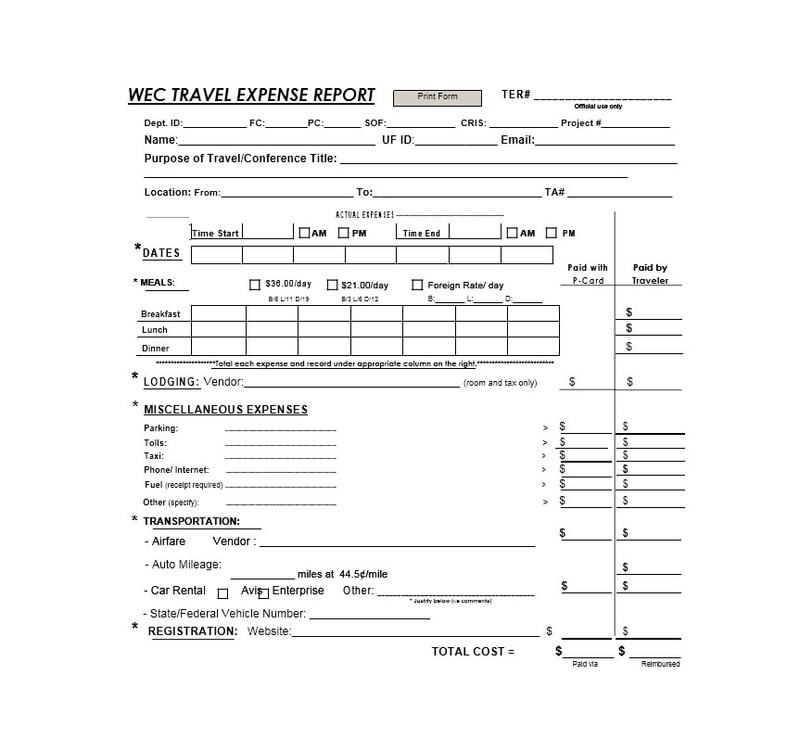 Business traveling usually involves planning as well as follow-up. This helps ensure that the trip reaches all the goals. It also ensures that the traveler gets back the money he spent for his travel. 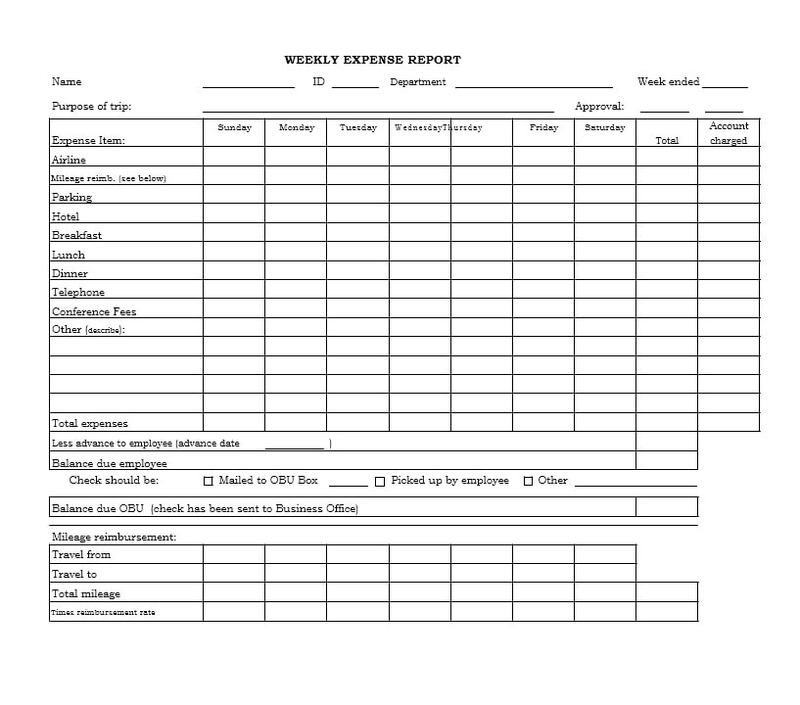 Such a report clarifies all the expenditures made for business-related activities. 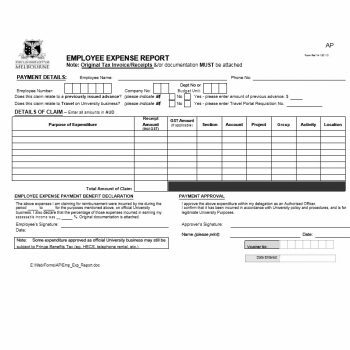 It usually comes with an organized compilation of all the receipts from the expenses. 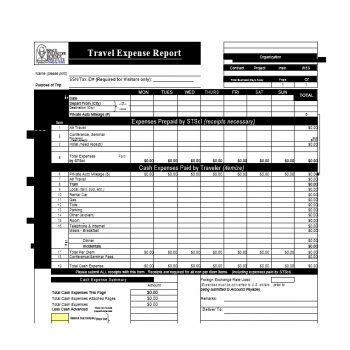 When you include the receipts, they would verify that everything you spent was for the trip. 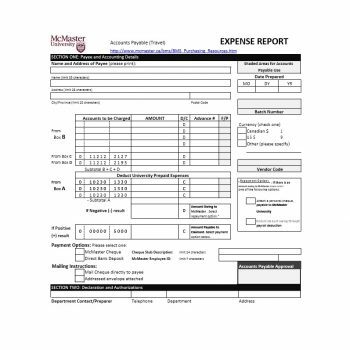 By keeping and attaching the receipts, you’ll be able to include all expenses. There’s a very little chance that you’ll miss anything out. 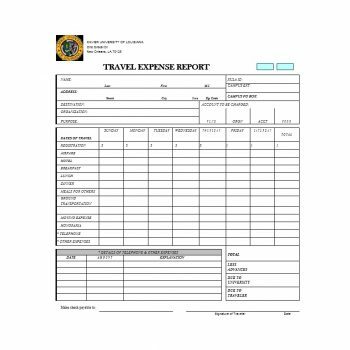 Before you make your own travel expense report template for your business, you should know how to use it. 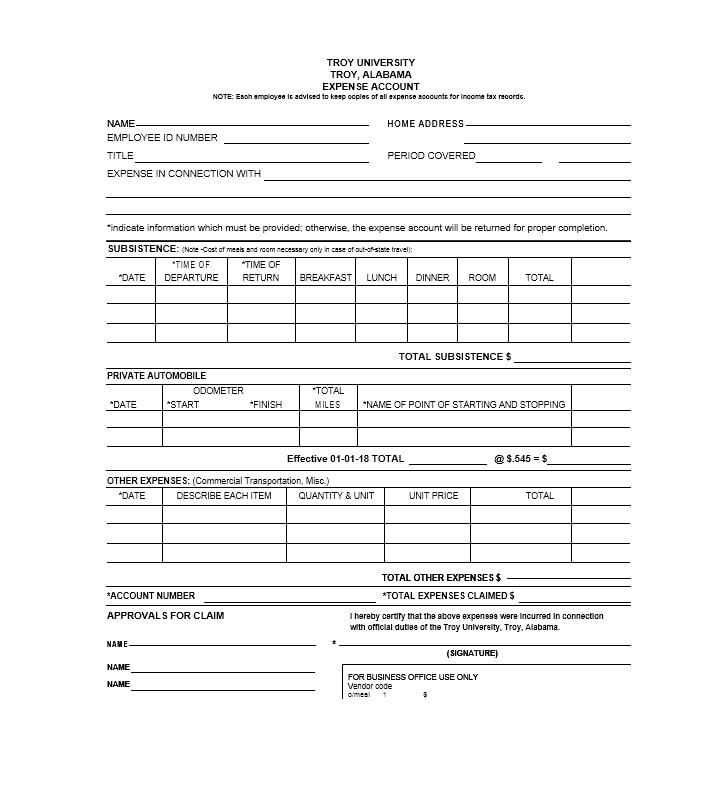 Employees must always submit this document as soon as possible. It’s best to accomplish and submit it on the next working day after their travel. 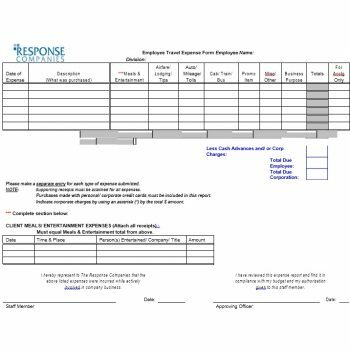 If the employees don’t have time, they can still make the report. But they should make sure to submit the document at least within a year of their travel. 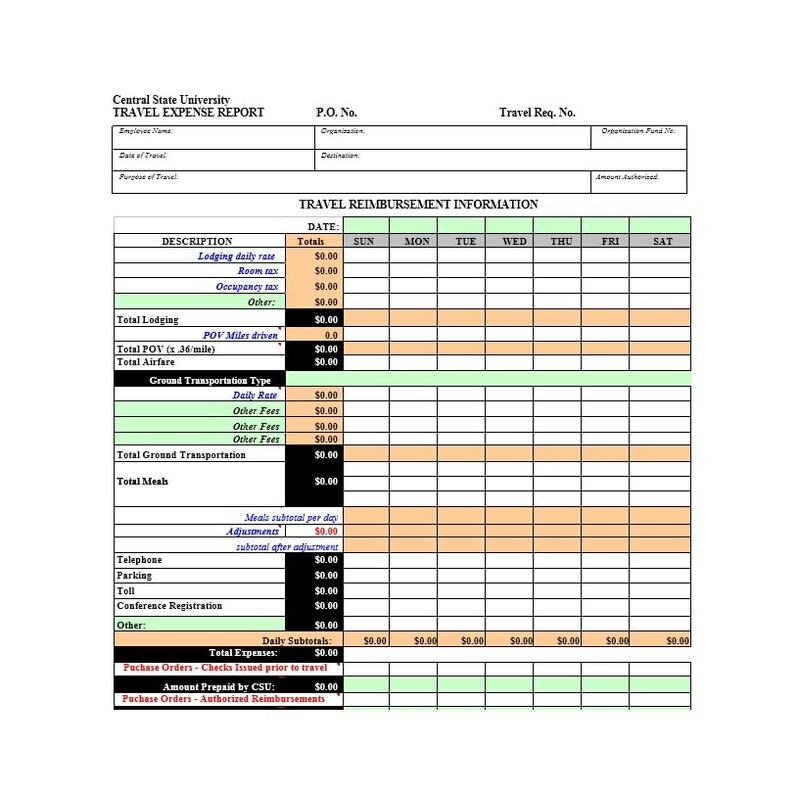 When you submit this kind of report, you do so for a couple of reasons. 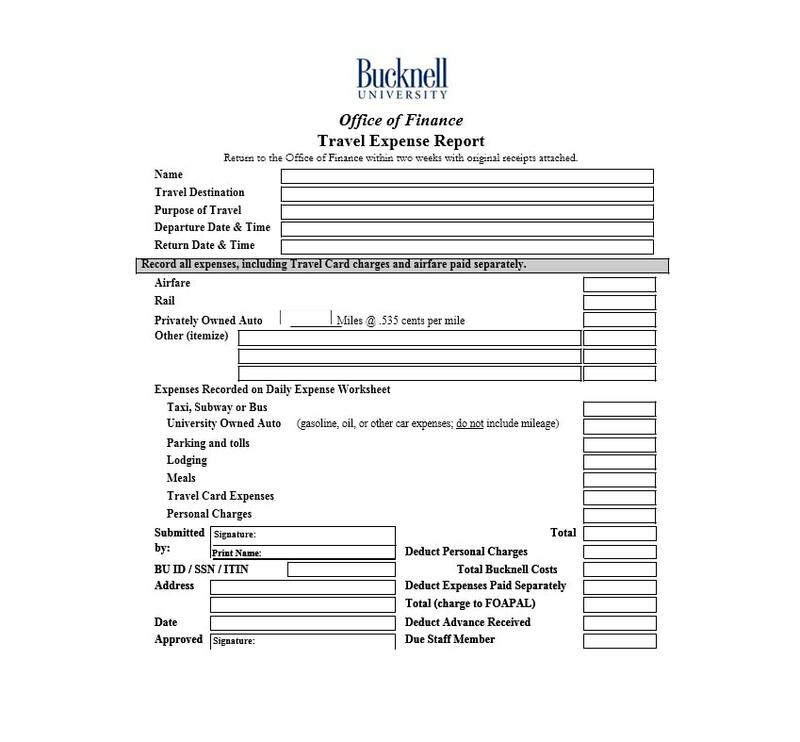 First, you may want to reimburse your expenses from your trip. 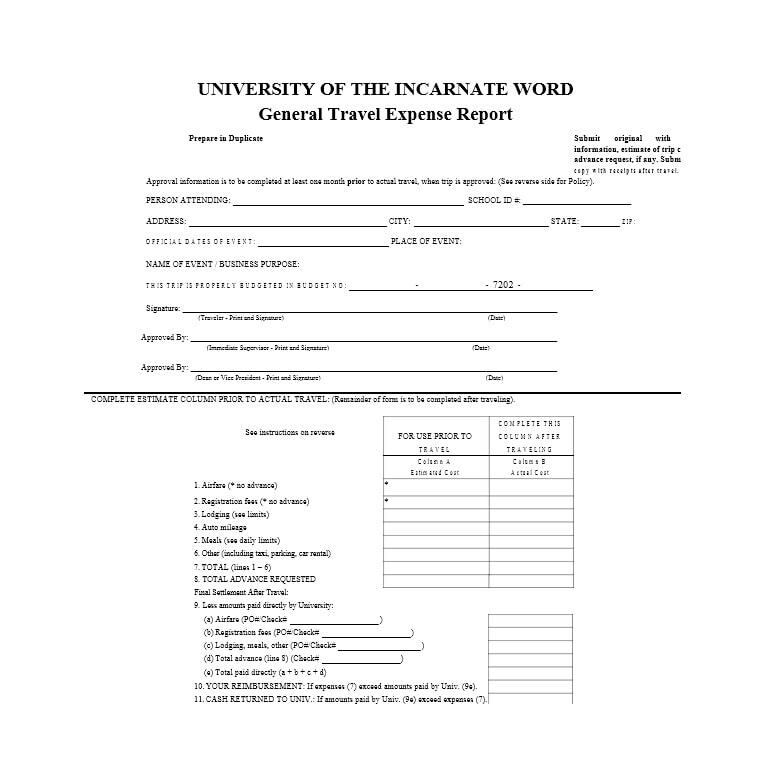 You would also have to submit this report if you received a travel advance before your trip. 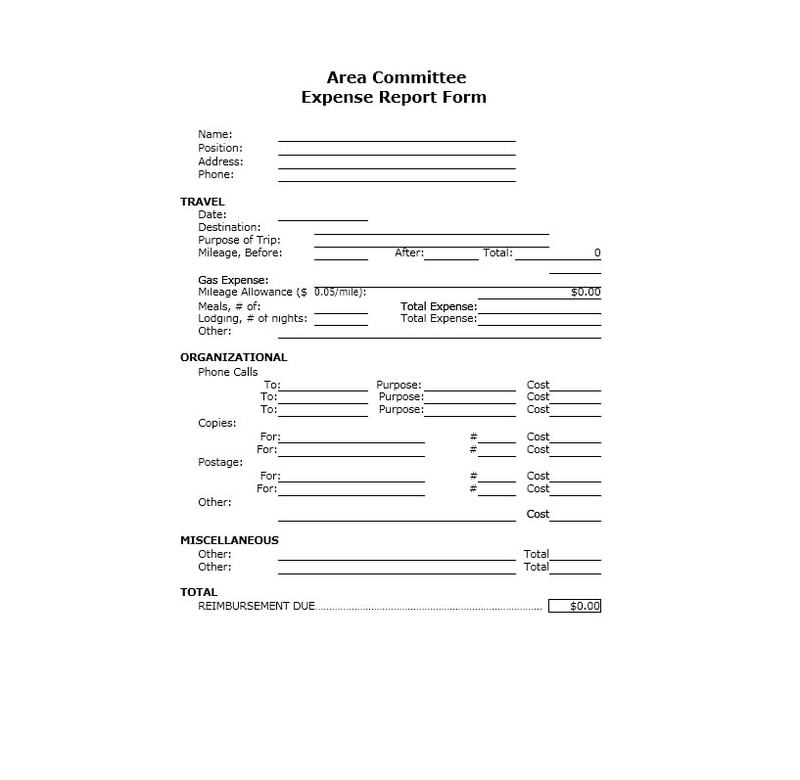 You have to give the report along with all the receipts as attachments. 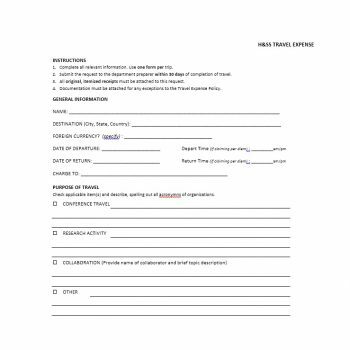 Documents which prove that you attended a conference. 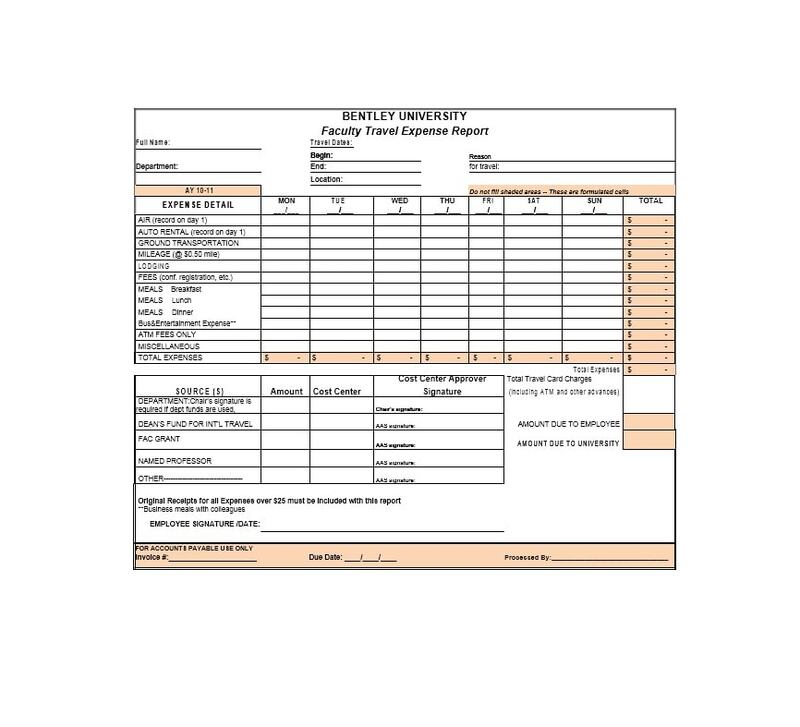 For instance, you can attach the program of the conference you attended. 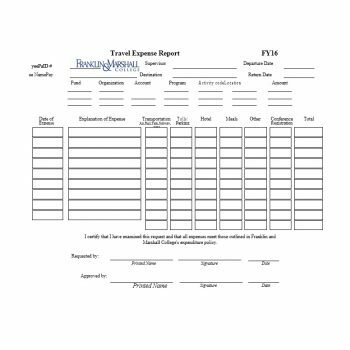 This would verify that you traveled on business. All the receipts for your expenditures. 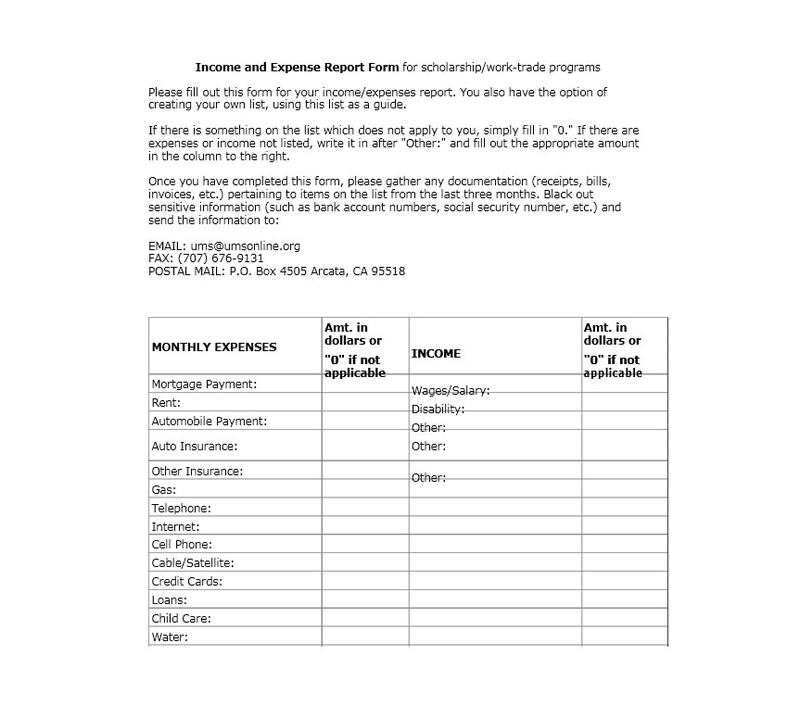 This is especially important if you want to ask for reimbursement. Always attach original receipts. 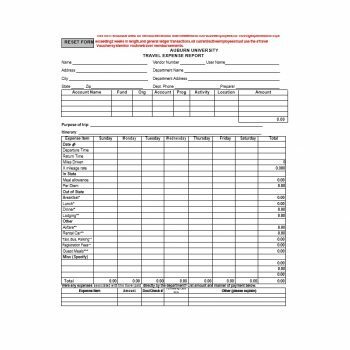 For security purposes, you can make copies of the original receipts. Keep them for yourself in case you need to present them again. 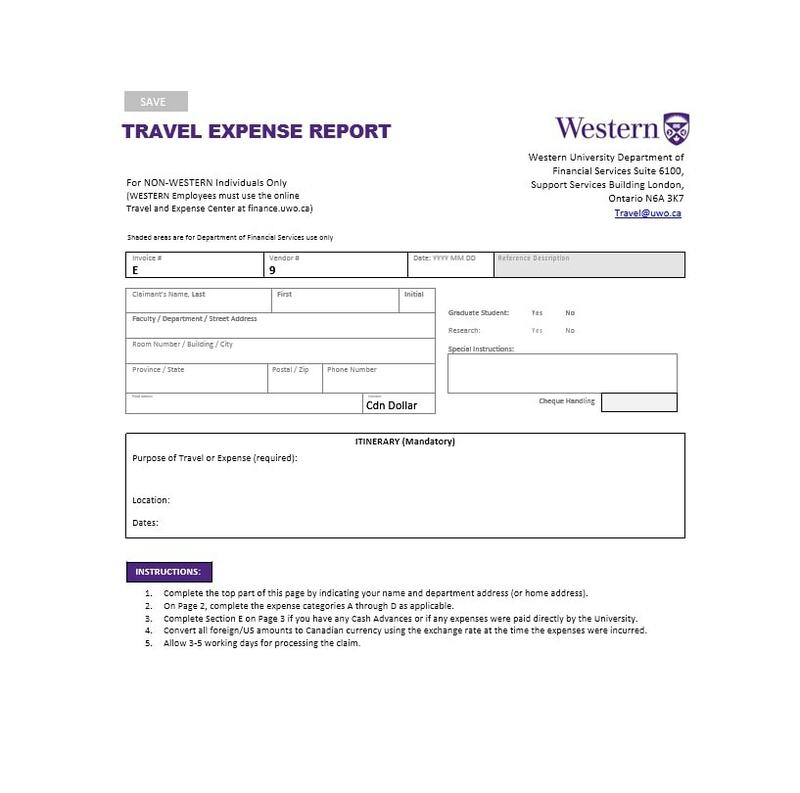 Travel receipts and parking fee receipts. 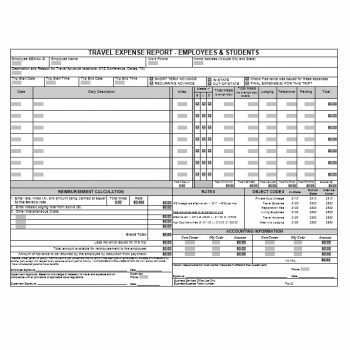 If your office doesn’t have a template for this report, you may download one from here. 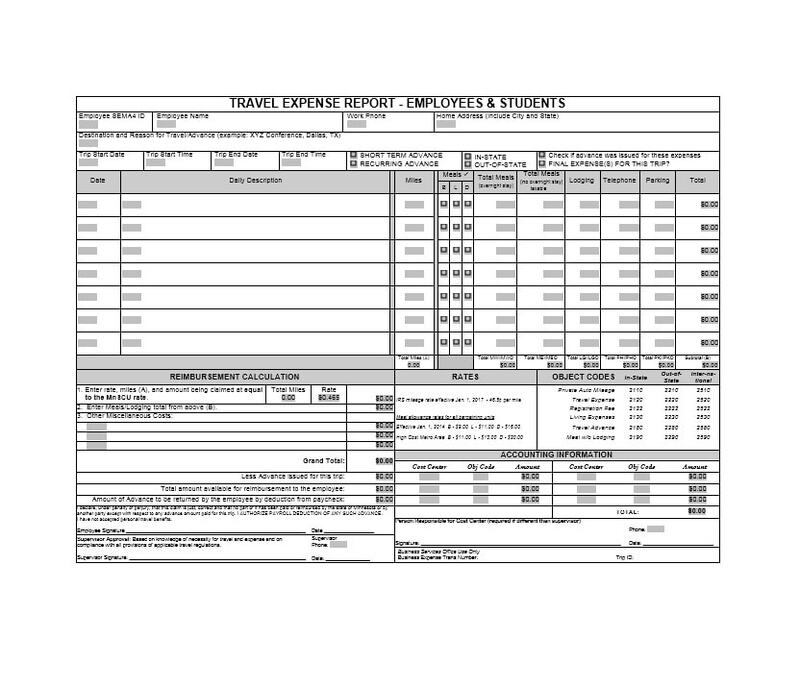 You can use the template itself or use it as a basis for your own report. 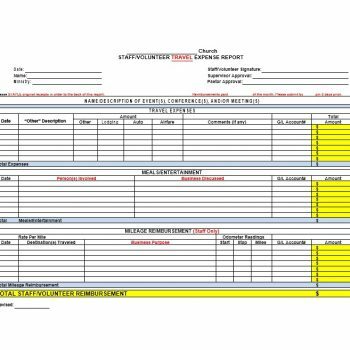 Once the employee fills up all the required information, he may print out the form. Then, include all the attachments and submit. 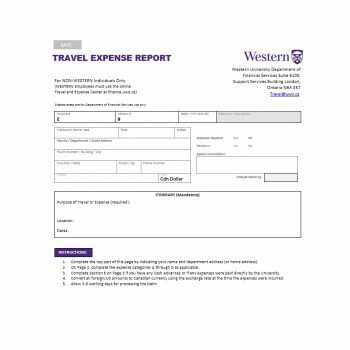 After you return from a trip, you may have to submit a report about all your travel expenses. 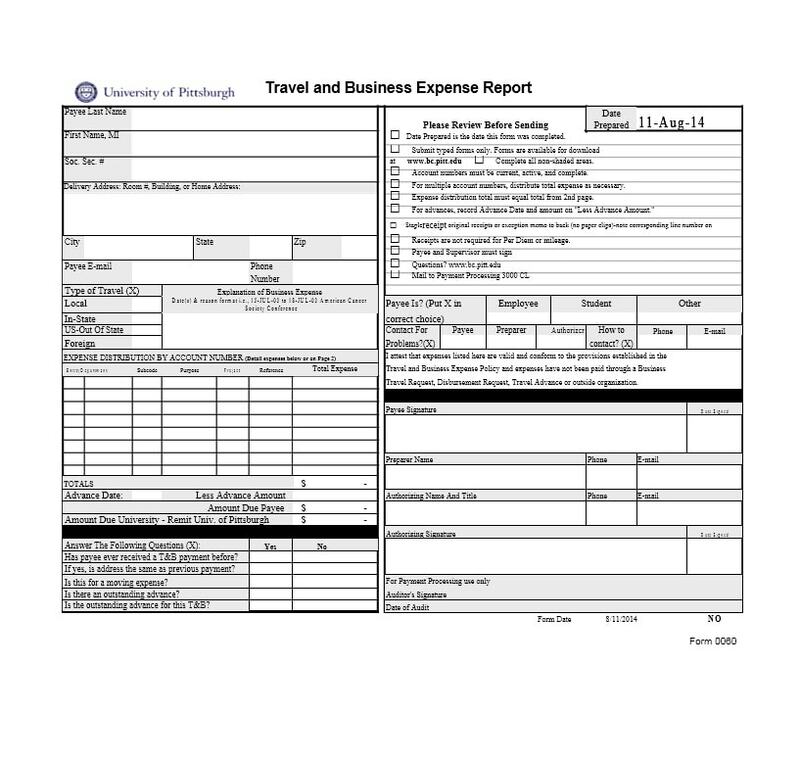 Such a report is very useful especially if you’re asking for a reimbursement for what you’ve spent. 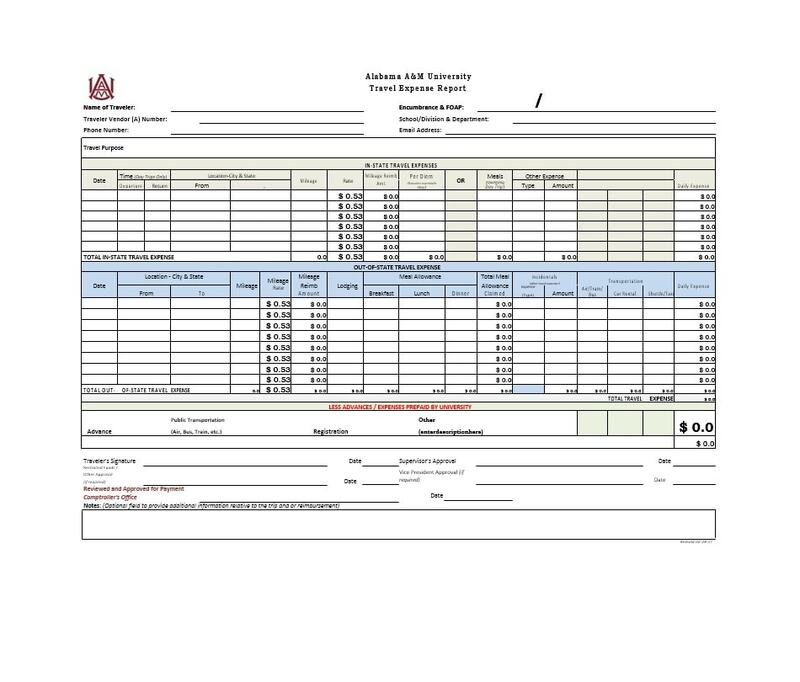 Attach all your meal receipts along with your report. 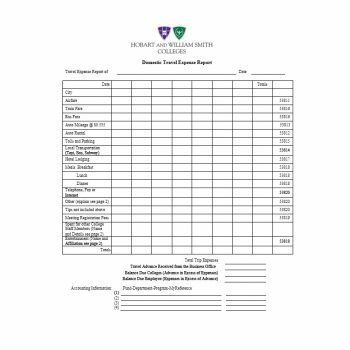 No matter what the amount is, you need to keep and attach the original receipt. 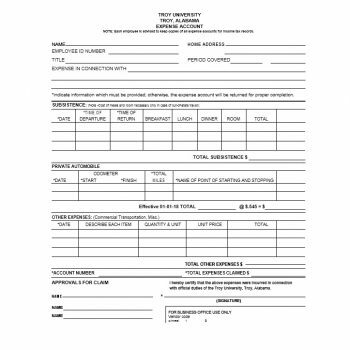 In some cases, you may need to ask to have your name written on the receipt. This would prove that you’re the one who ate the meal. 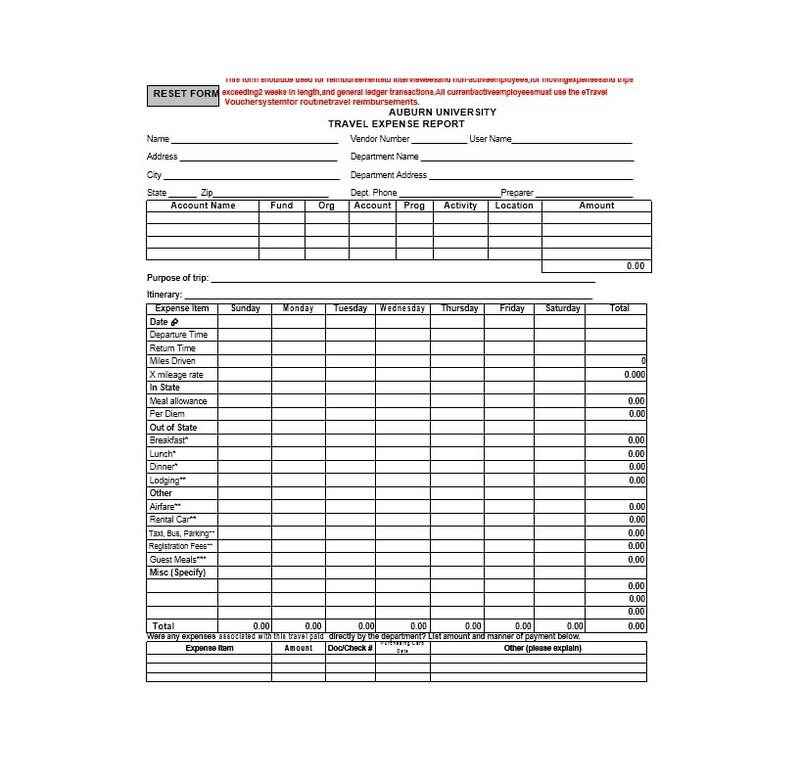 Try not to lose your meal receipts unless you don’t need to have them reimbursed. You need to take note of all your automobile mileage as well as the rates. 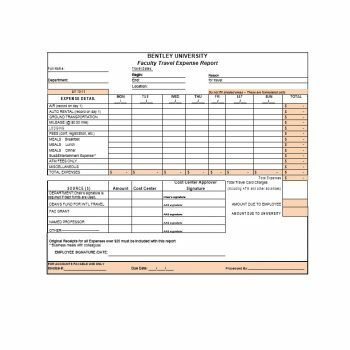 Just like with meals, you’d have a budget for your vehicle expenses. If you used your own vehicle for travel, the mileage becomes very important. Along with it, you need to indicate some information. These include your origin, destination, and purpose of travel. You may also keep any toll and parking receipts for reimbursements. However, in some companies, you won’t receive reimbursement for gasoline costs. If you don’t have your own vehicle, you may use a rental vehicle. This is usually the last resort for travel. You may rent a vehicle if it would cost less than taking other means of transport. When you choose to rent, it’s also useful to get rental insurance. Do this in case anything happens while you’re traveling. You can get the minimum liability insurance. This isn’t automatically included in the rental contract. Or, you can go for all insurance coverage if your budget allows for it. 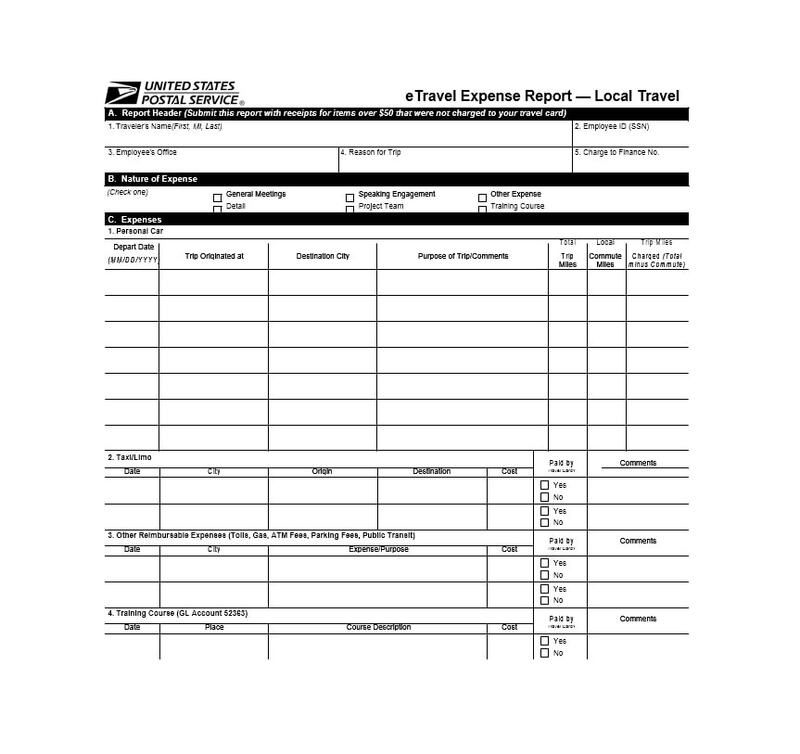 Just like with personal vehicles, you also need to include receipts for toll and parking fees. 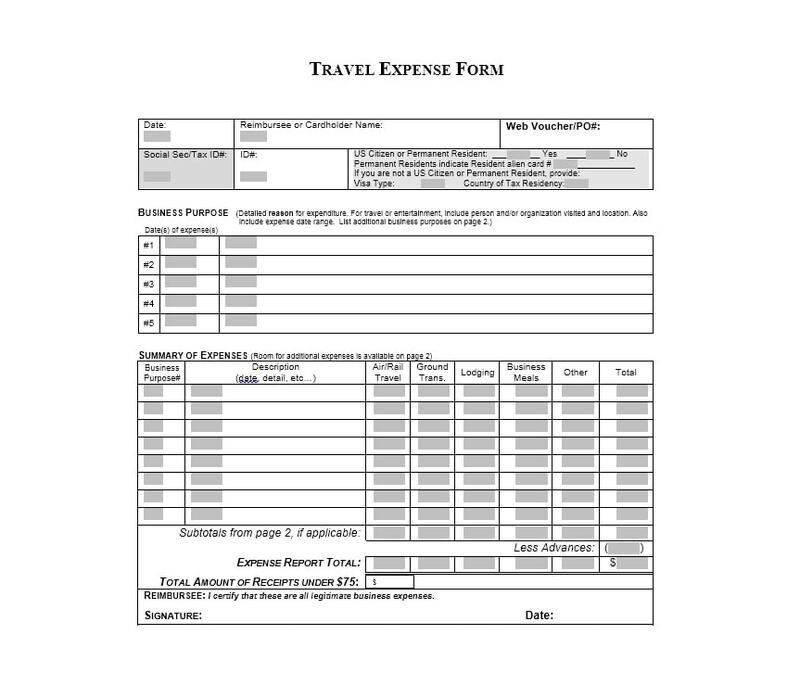 You can purchase train and airplane tickets as per your needs. This is if your company doesn’t purchase the tickets for you. 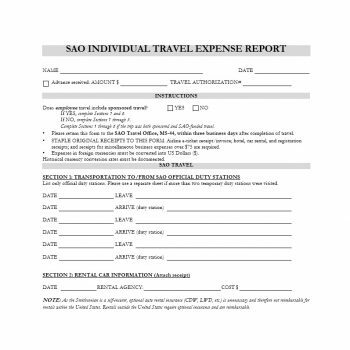 You can use your own funds first then ask for a reimbursement after your trip. 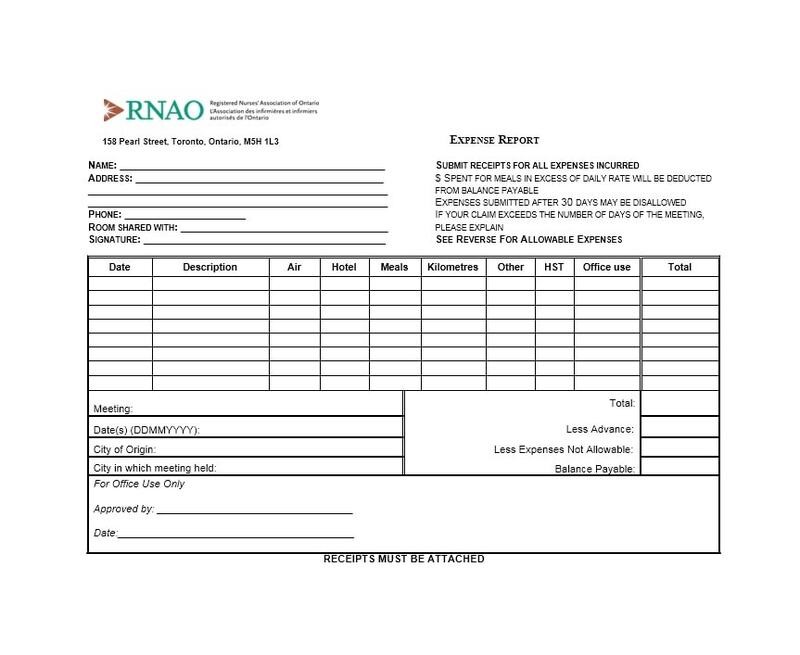 In order to get the reimbursement though, you need to include supporting documentation. 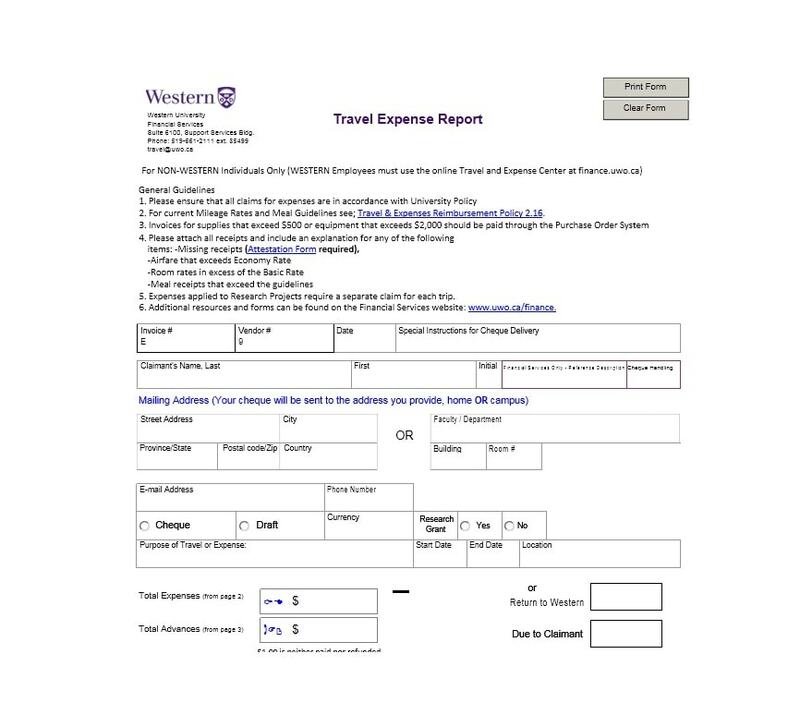 These include the receipts or a copy of your ticket. 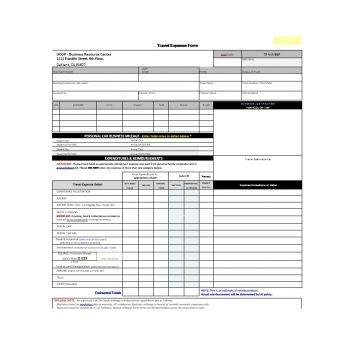 You should give a detail of your entire itinerary with all the details. 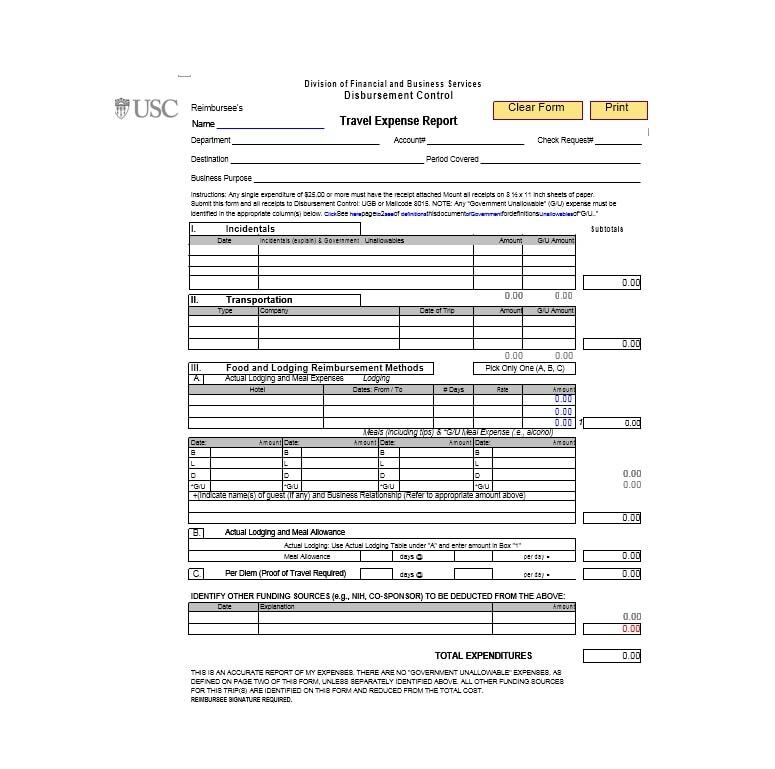 These include the flight number, ticket cost, class of service, and other such details. 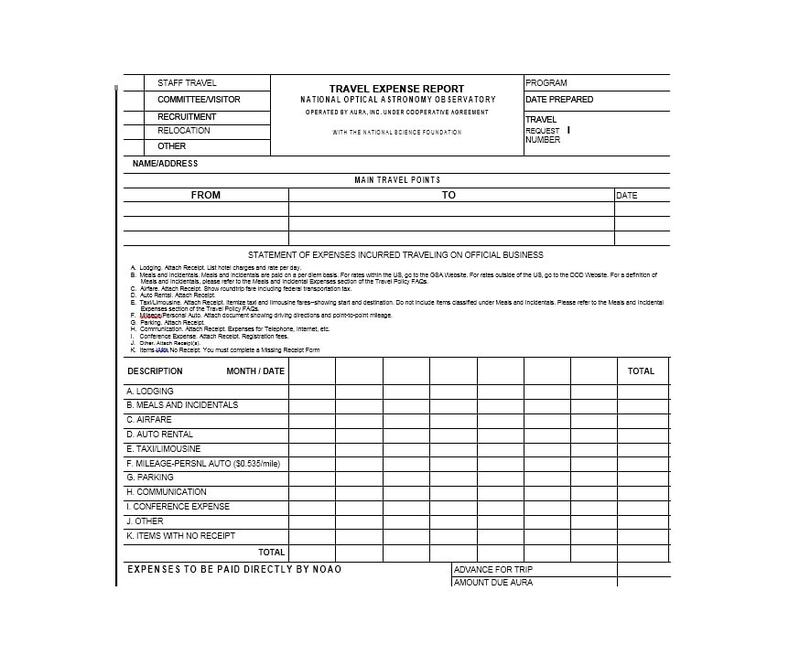 It’s better if you can also attach your boarding pass if you traveled by plane. 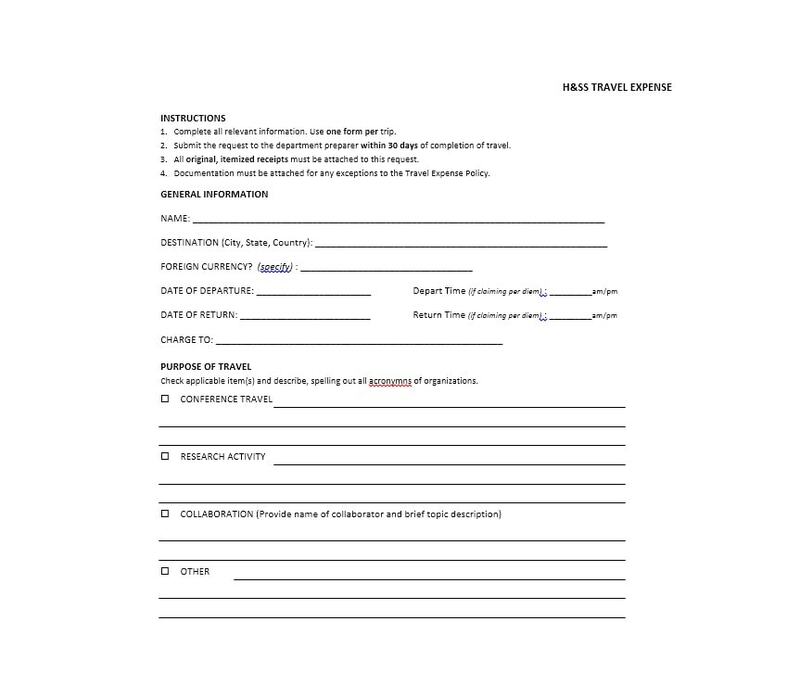 Also, include your proof of payment to make the attachment more official. Again, your company may do the hotel accommodation booking for you. But in some cases, you’d have to make your own bookings. In this case, ask your daily budget so you can start looking for rooms which fit into your allotted budget. 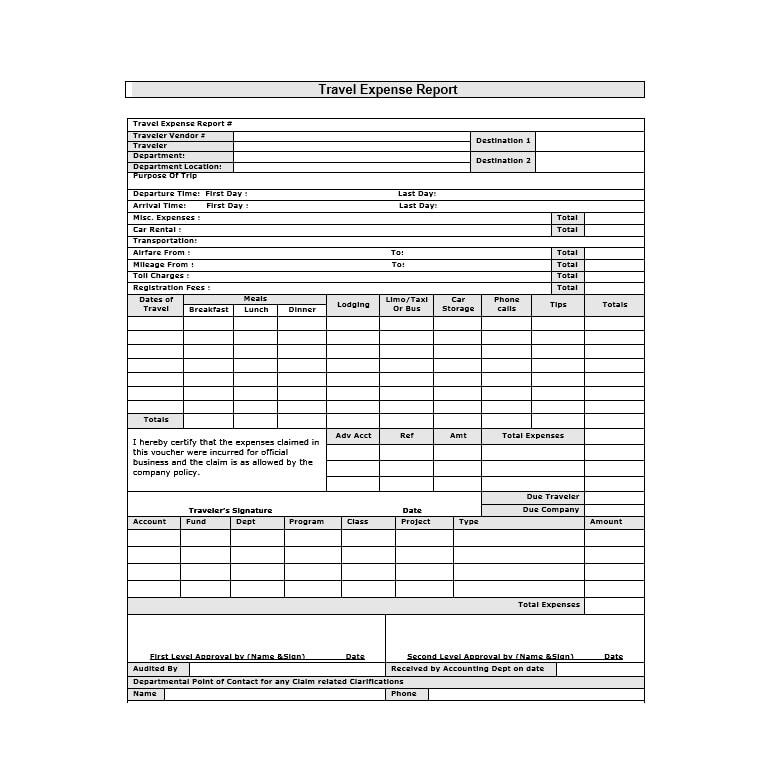 Then, you need to submit the receipt along with your report. 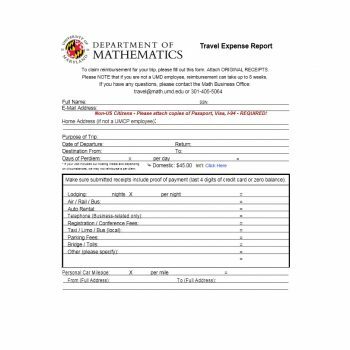 It should contain the room rates, the date/s of stay, and a proof of payment. If you choose to, you may book a more expensive hotel on your trip. However, you’d have to pay for any extra costs. 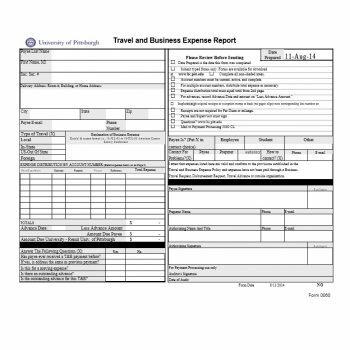 These are the most common things you need to include in your travel expense report. 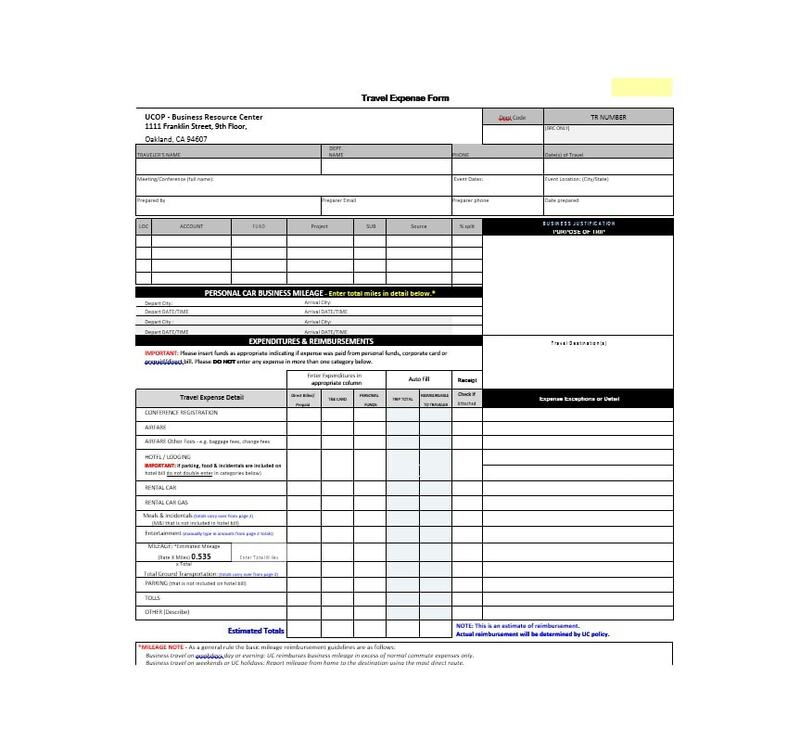 You may add more details and information as needed or required by your company. 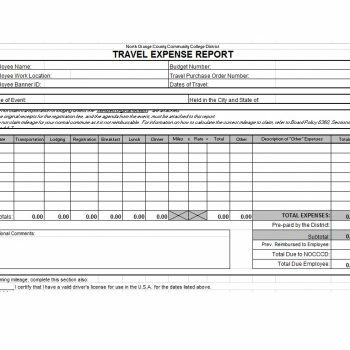 If your company has its own travel expense report form or template, all you’d have to do is fill it out. 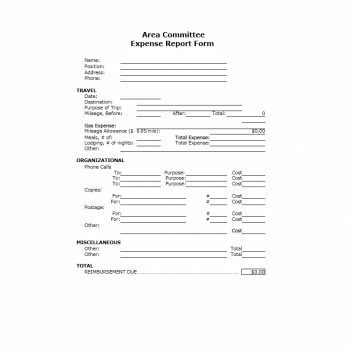 Then ask the person in charge what other documents you need to attach to the report. 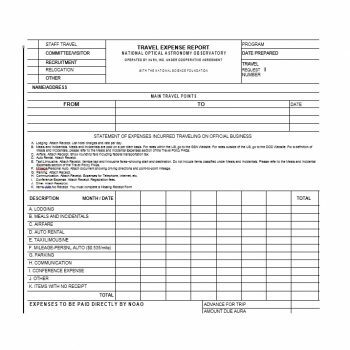 Write your full name, department, and job title. You must add your contact details. 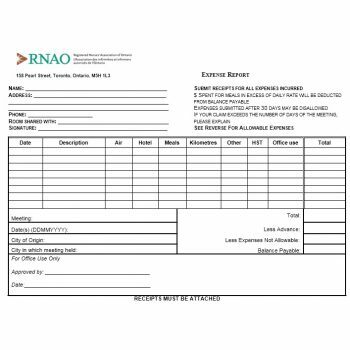 This information is necessary in case the person who will review the report needs to ask you some questions. Write the date/s of your travel. Also, write down the specific reasons for your travel. 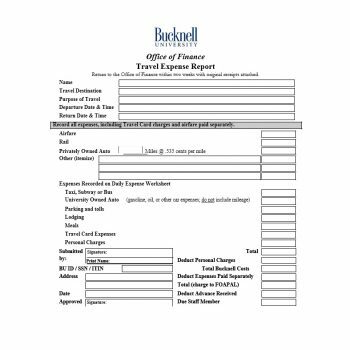 No matter how many days you’ve traveled, specify all the details of each day. 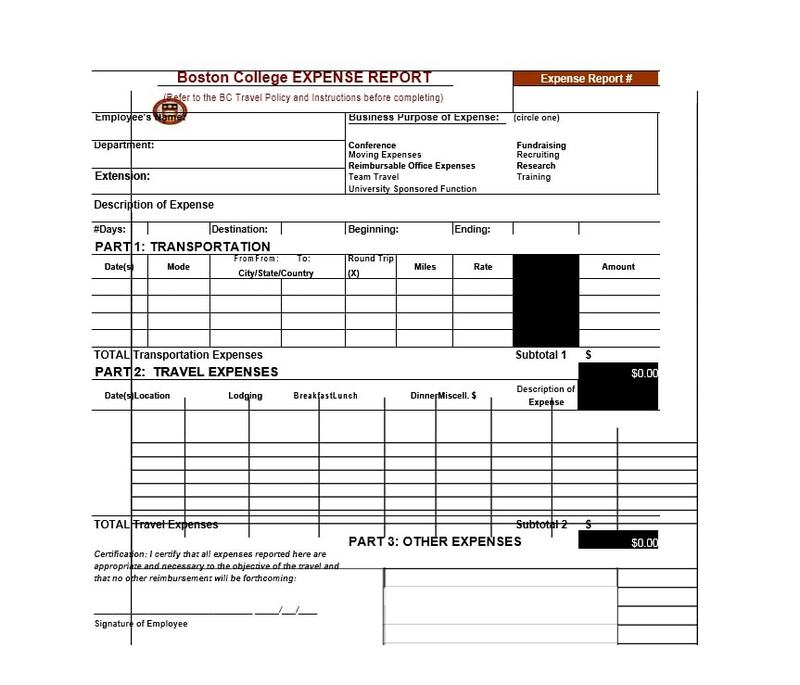 Make a note of all your expenses each day too. 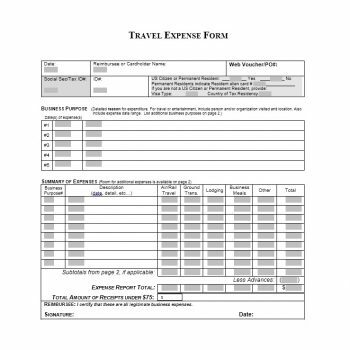 If you exceeded the travel budget, then state your reasons why. If you used foreign currency, you may have to note the conversion rates too. You should know who’s in charge of all expenses. 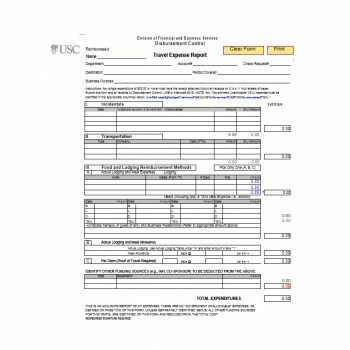 You may have to certify your expenses first before you submit your document. 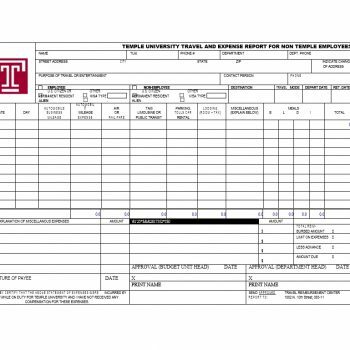 This means that the fund manager would have to approve, sign, and date your report. 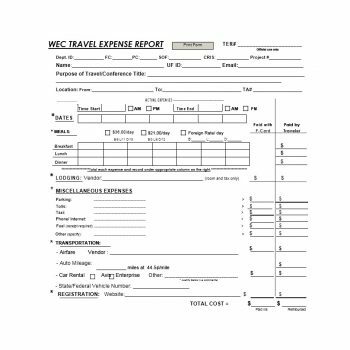 If personal meals are part of your business travel expenses, then you need to take note of all of them. 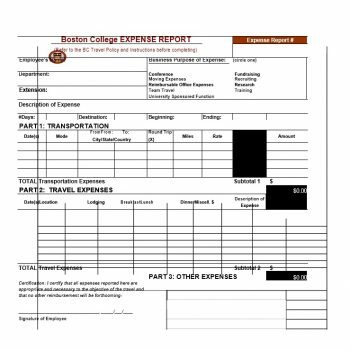 Aside from this, you may also have to include the meal receipts to prove the expenses of your meals. 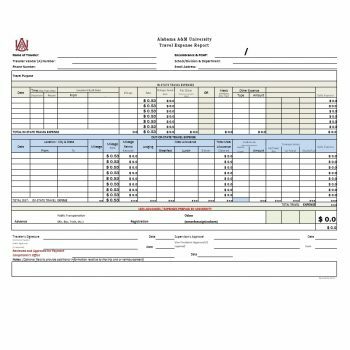 Organize the receipts and include the dates of the meals too. 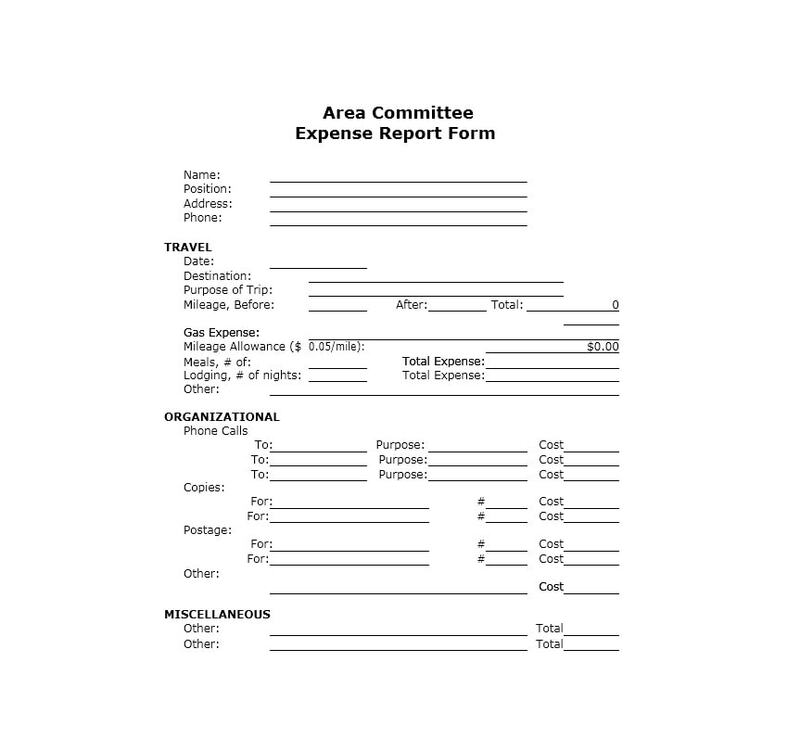 If you’re traveling as a group, you need to indicate that on your report. 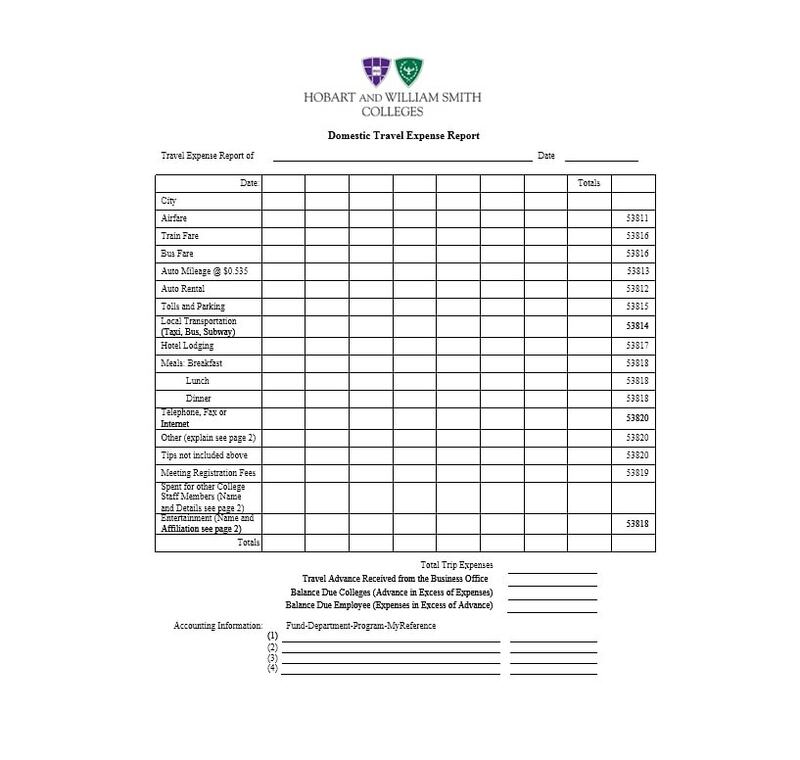 Write down the meals you took as a group and how much they cost. Also, include all the names of the people in the group who partook of the meals. 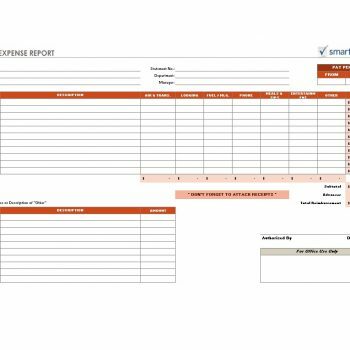 Again, attach all the receipts of your group meals along with the report you’re making. 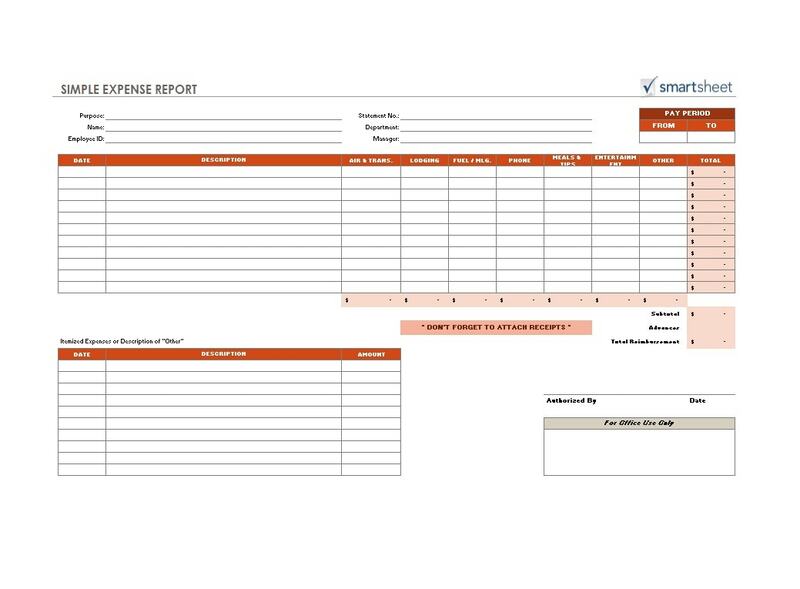 As each day passes by, you should take note of all your expenses. 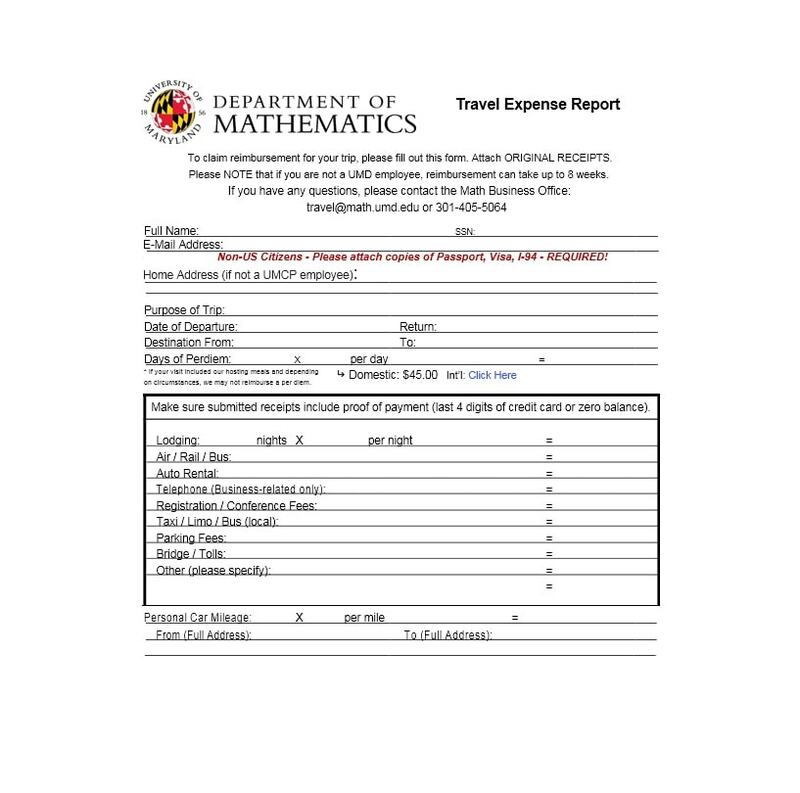 You may receive a daily allowance for your trip. If so, you have to stick to your budget and try not to exceed. 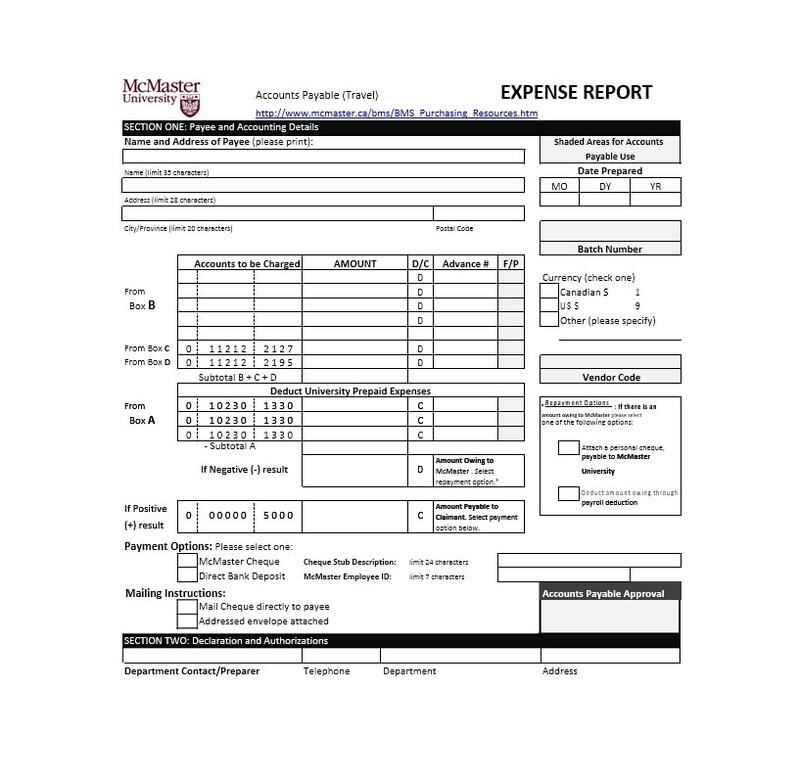 No matter what miscellaneous expenses you’ve made, make sure to keep all the receipts. These will serve as proof that you spent money on business-related things. 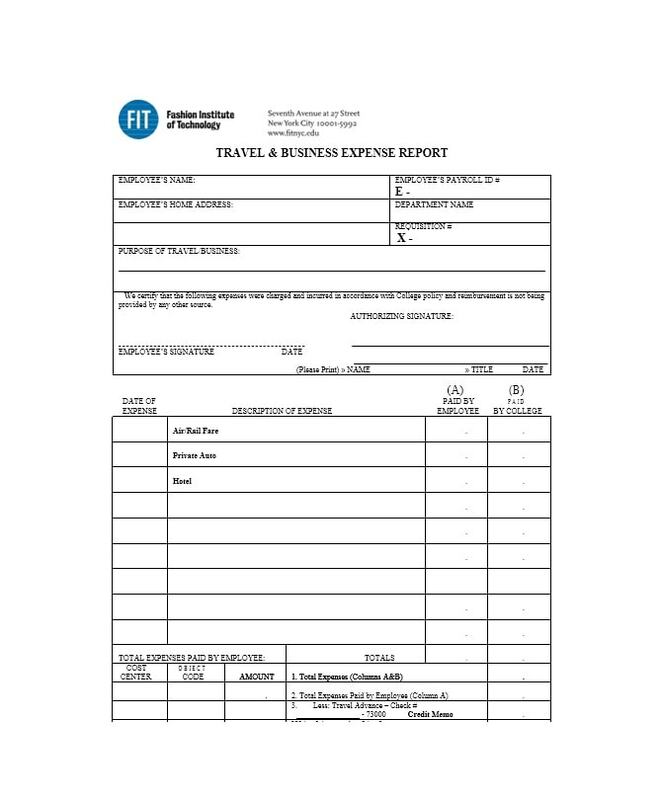 If you rented an automobile or any other kind of vehicle for your trip, note your mileage. Then, also note the description of all the trips you made using the vehicle. 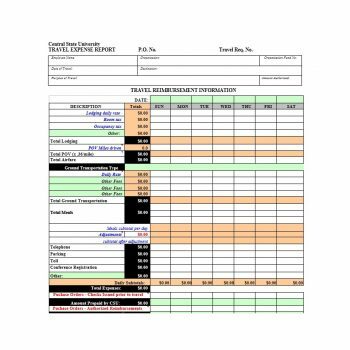 Finally, organize your report by attaching the other documents in chronological order. 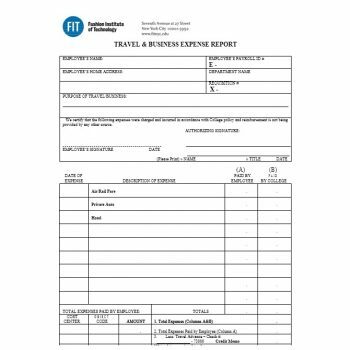 Before you start making the report, learn all about your company’s travel procedures. At one point, your organization may send you on a business trip. 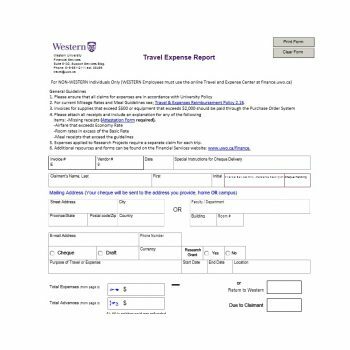 Then, you may have to complete a travel expense report form or template when you return. 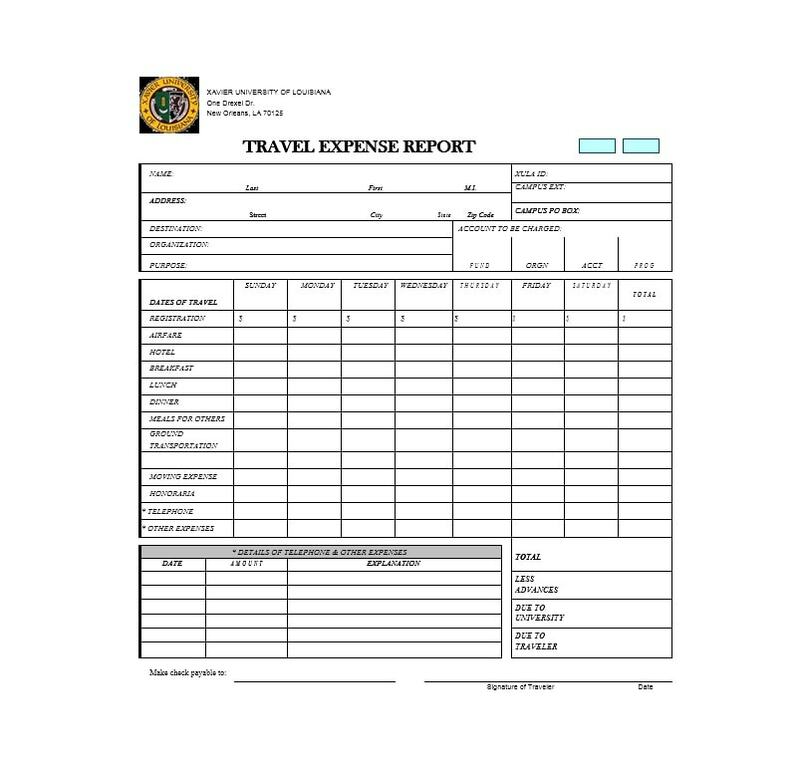 The report shows the details of all the expenses you made while on the trip. 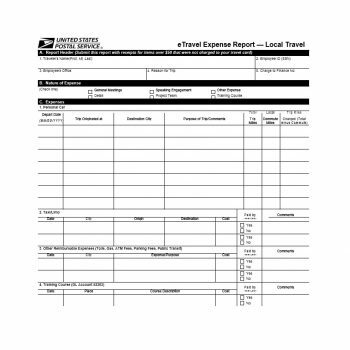 It’s an important report as it contains useful information about your trip. When you travel, you need to think about a lot of things. 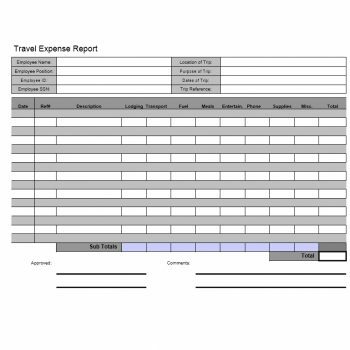 Whether you’re traveling on your own or with a group, you need to keep track of all your expenses. 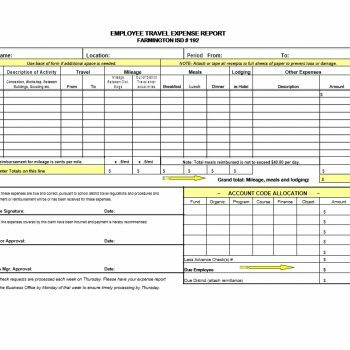 Do this so that you won’t have a hard time completing your report. 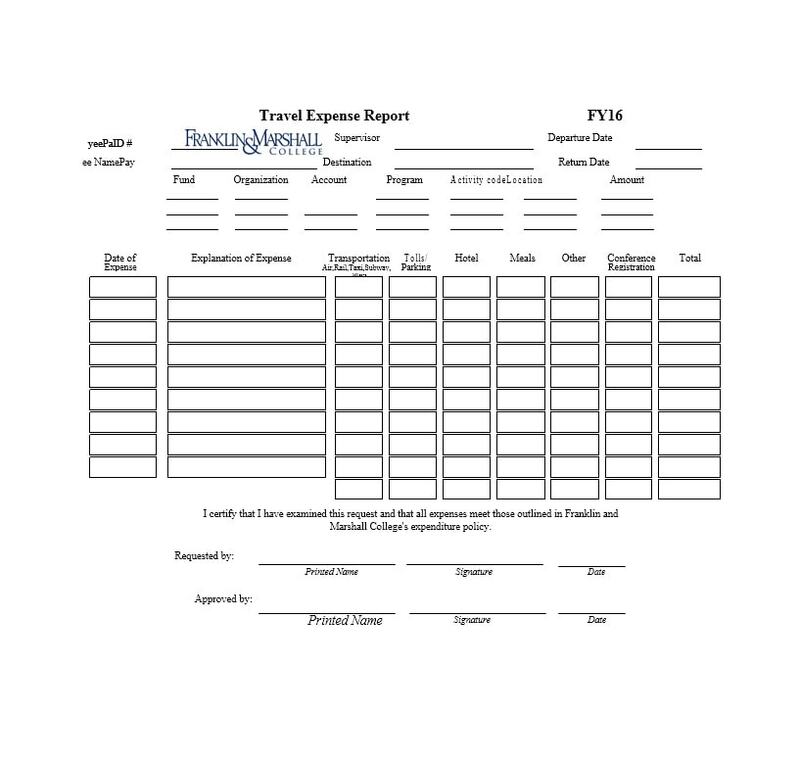 When you have a travel expense report template, then making the report becomes easier. 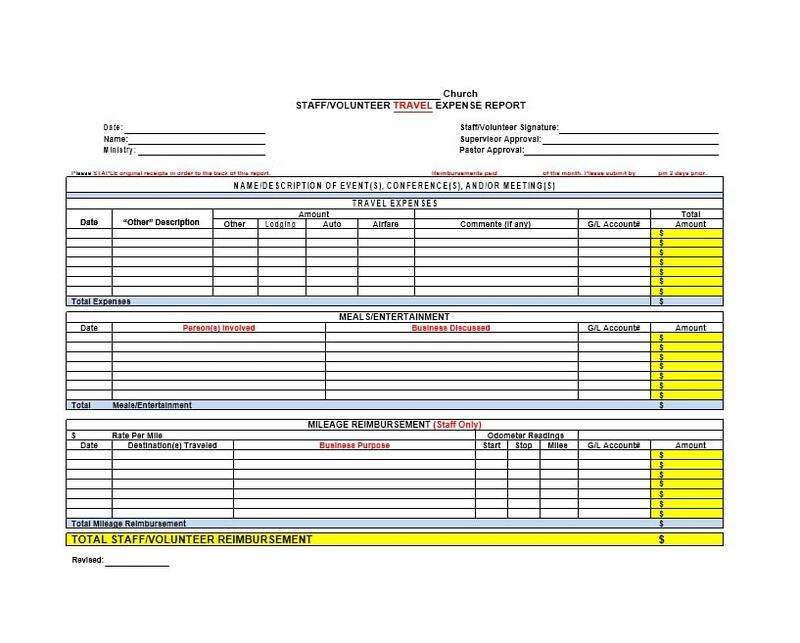 All you’d have to do is organize all your attachments and record the details in the template. 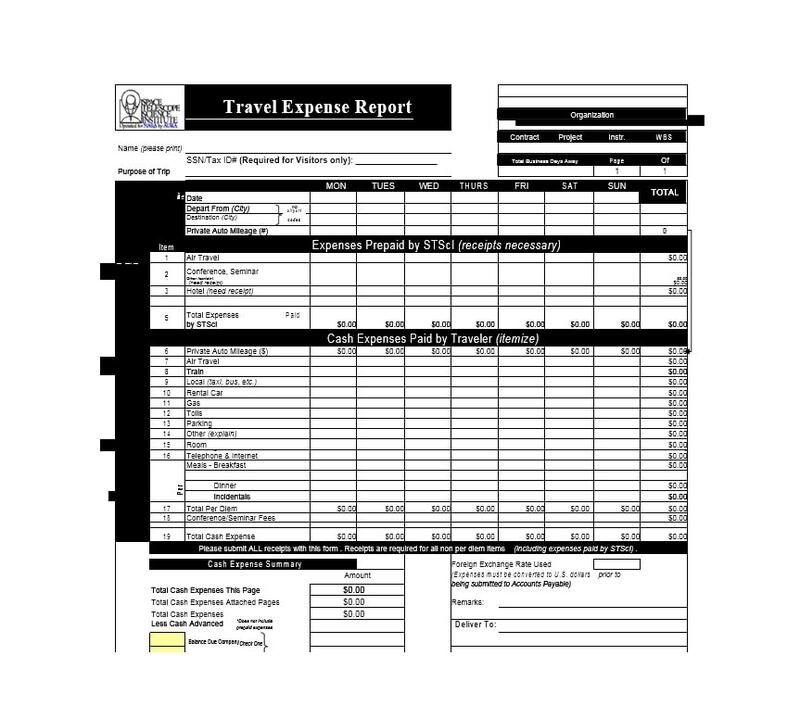 Such document is very useful as it shows all the details of your expenses on your business trip. 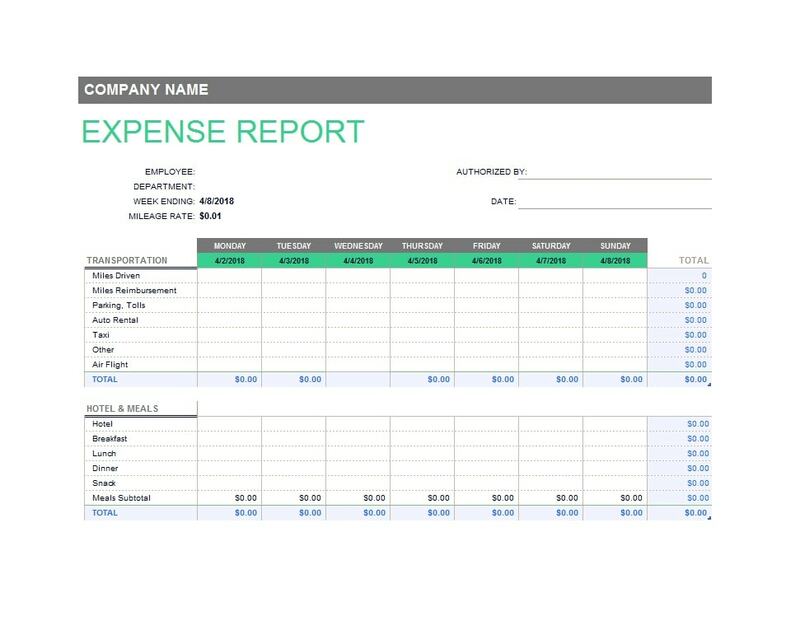 It allows the employee to make transparent all his expenses. 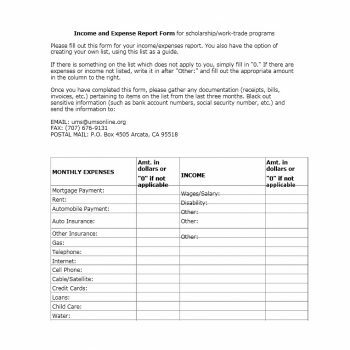 This is especially important if he’ll ask for a reimbursement. 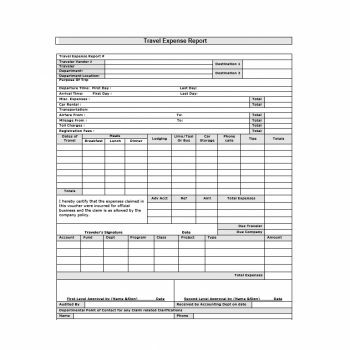 Then, the person who checks the report may verify all the expenses. 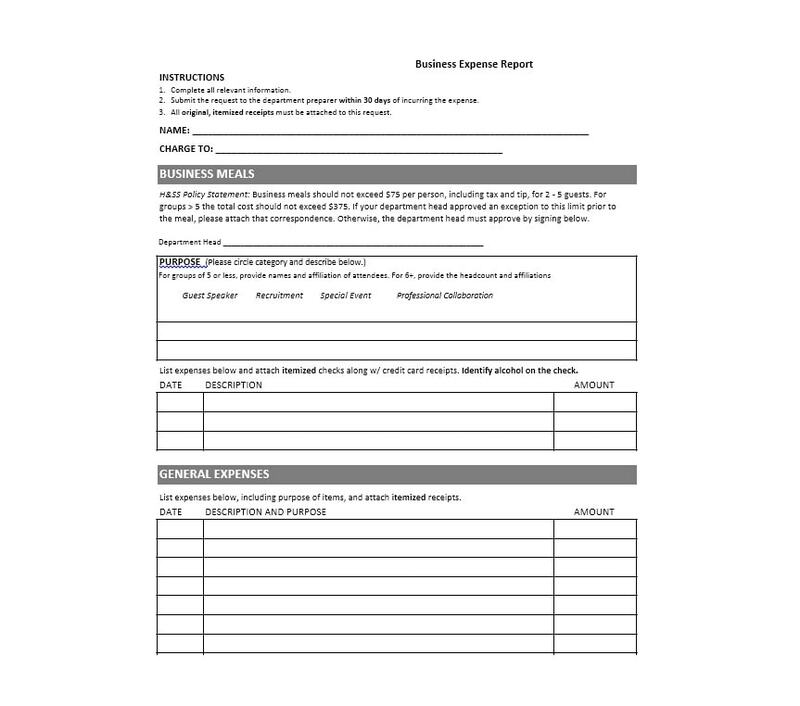 This allows the company to reimburse the employee in a timely manner. 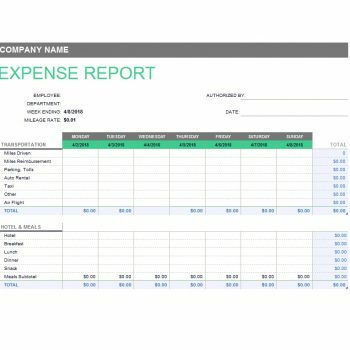 It gives the company a better means for analyzing costs during business trips. 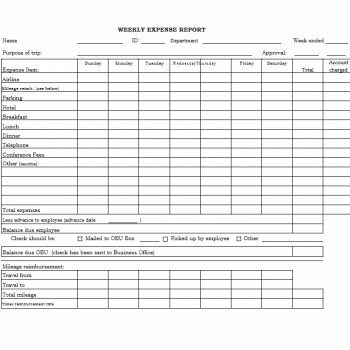 It serves as a record of all the expenses made during an employee’s business trip. 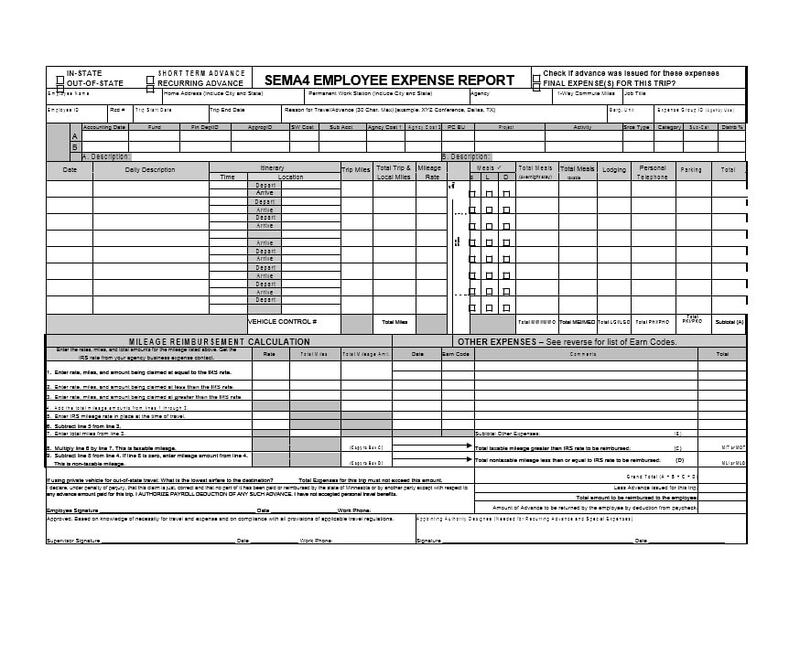 So when planning for a budget, the people in charge may use the previous reports as a reference. 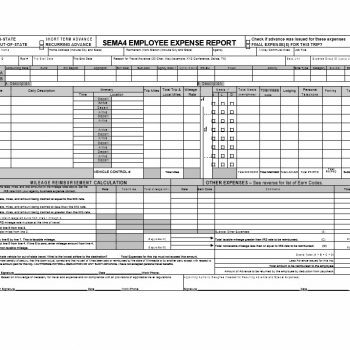 When a company uses this kind of report, it will be able to get the most out of tax deductions. 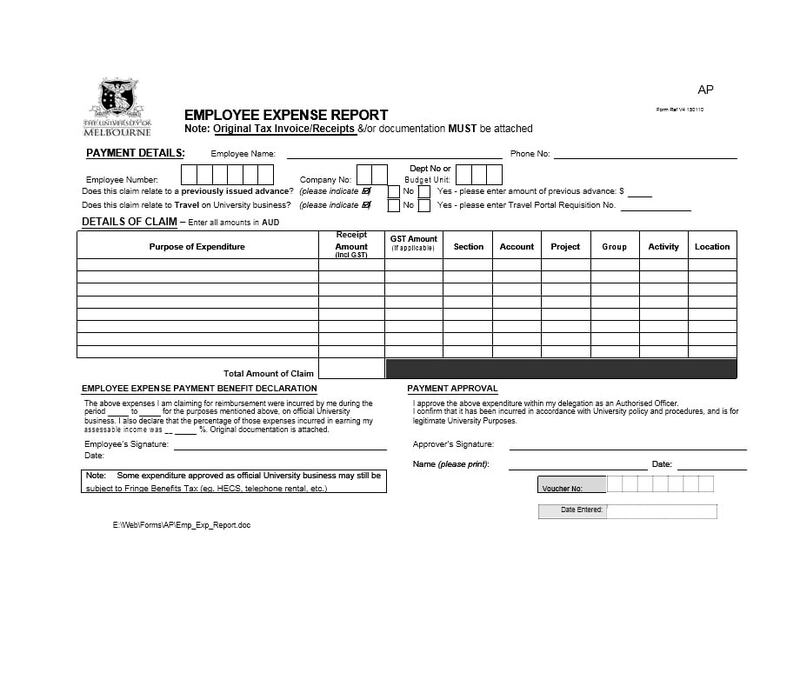 It gives the employers information about spending. They get to know what happens when their employees go on a business trip. 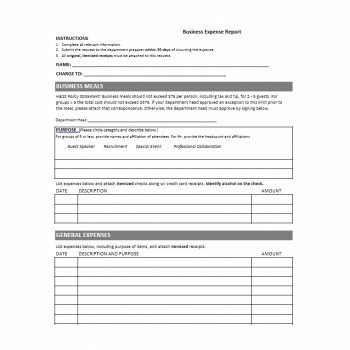 Nowadays it’s easy to make forms and templates to use for your company’s reports. You can make them from scratch or download our template here. Such reports are very beneficial. They make information organized and easy to read. This benefits the company. 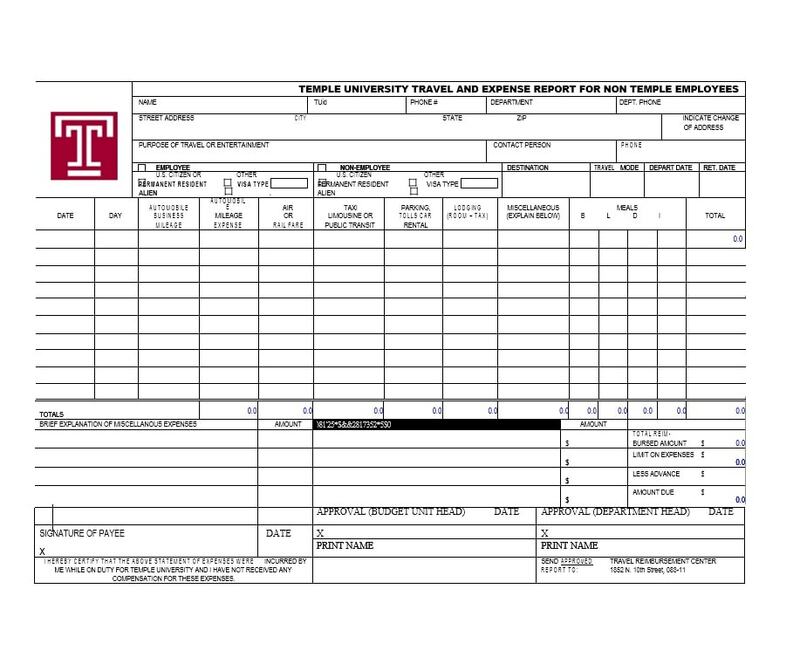 When an employee makes such a report, he gets reimbursed faster. This benefits the employee. 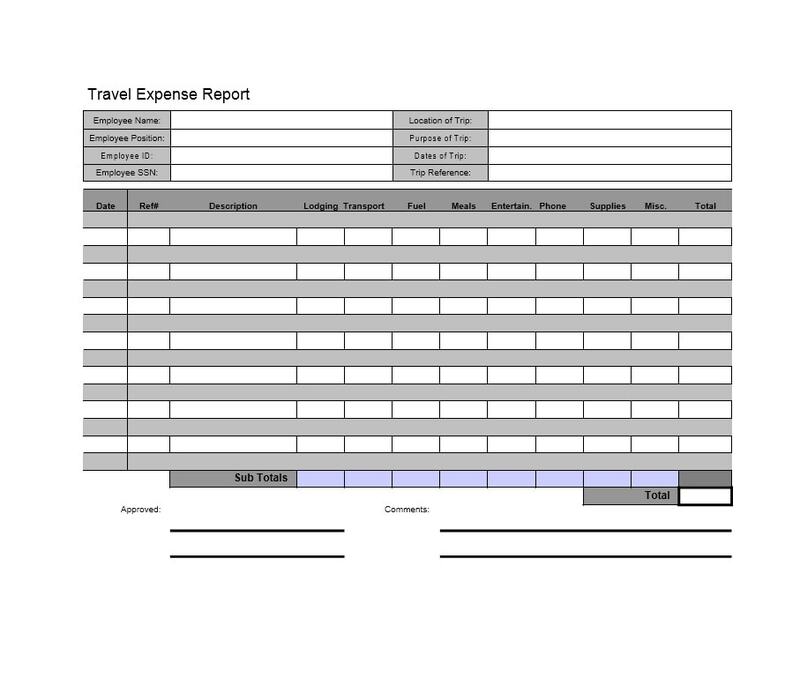 So making a travel expense report template is really necessary for a company.